Historical facts and battles have inspired many metal bands to write glorious powerful music. 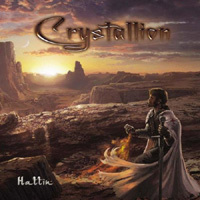 Bavarian band Crystallion focuses on the Templar Myth and their second album ‘Hattin’ is a concept album about the battle of Hattin, which forced the Christian authority in the Holy Land into the defensive. 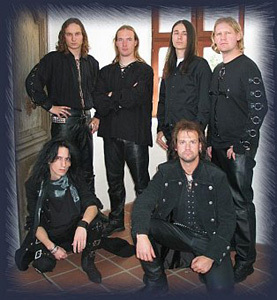 Their epic melodic power metal has affinity with bands as Rhapsody and Helloween, but they add a personal touch to it. I had a nice talk with vocalist Thomas Strübler to introduce this band to you. The band was formed by other members before you joined them, isn’t it? That’s right. The band was founded in 2003 by our bassist Stefan and our drummer Martin and between 2003 and 2005 the keyboardist, myself and the guitarist joined. In the beginning the band did more hardrock stuff, not the power metal we do now. From 2005 on we chose to play the direction we are playing now. On internet I see all kind of different influences. One mention Manowar and Iron Maiden, another one prefers thrash metal. Is your music a kind of mixture of this all? Yes, that’s true. Particularly one guitarist comes from a different direction; you may recognize it from his appearance. He comes from a direction more into darkwave stuff, but he likes to play the stuff we do and that’s really interesting to have his input in the band, because the way he plays the guitar and the solos makes it more interesting. I like having people from different directions in the band. Does it means you all come together to write songs or are there a few people focused on that with the others just filling in? That’s actually true for us because Stefan is not only our bass player but also our main songwriter, so basically all the music until now has been written by him and about 50% of the lyrics were written by me but the rest was also written by him. So it is Stefan and me who write the songs. Maybe that will change a bit in the future but I think it will remain mainly the same. Can you tell something about the first album ‘A Dark Enchanted Crystal Night’? It was our first album, released in 2006 with a smaller record company. The musical direction was the same and in some songs the lyrics were also related to what we did now about the Templar myth and historical stuff. But it was not a concept album like ‘Hattin’. It was somehow similar to this one. Can you go a bit deeper into that concept and the lyrics of the new album? The new album ‘Hattin’ is about the battle of Hattin which was a famous battle in 1187 between the Christian and Muslim forces for Jerusalem and this battle marked the beginning of the end – as it says on the CD – of the Christian reign there. The whole story is about what happened before the battle, during the battle and immediately afterwards for Christian reign there and it was the return of the Muslims so to say. It definitely is, yes. There are some passages in the songs – how should I say – if people don’t read the complete story of the album and the explanations to the songs, some lines might seem strange, but if you really read the concept and see it as what it is, just a narration of the story of this battle, and I think it should not be too hot. I think you have to be careful and that’s what we thought about when we wrote it. There were some parts where we hesitated and said: can we sing it like this? Can we write it like this? But I think we found a way that everybody who is really interested in lyrics, will say it is okay. Are these topics just things you are interested in or does anyone of you have an historical background? Not an historical background really. It is just that Stefan, who I mentioned as main songwriter, has always been interested in history. Actually all of us, but he was particularly into the whole Templar story and had already a background of knowledge because he read a lot about it and so we said: “Why not write about it?” Everybody’s interested, he has the knowledge and so on. I just read a few things on the internet to really get into the whole topic, so I could write half of the lyrics. Does it mean you would like to travel to Jerusalem to check out the real thing? I think we definitely would like to do that, we’d like to go there, but we didn’t do it during the process of writing the album because it would simply be too expensive. If there would have been a major record company who suggested us to do so, it would have been great of course, but as it is now with our financial situation we had to do it with reading. You recorded the album at the Helion Media Studios in Munich. What about this experience? It took ourselves about two months to record it, but we were not actually two months in the studio, because there were one or two breaks in between and we didn’t record it live together but we had the drummer doing his part, then we had the bassist, then the guitarists recorded their stuff, then the keyboards and at the end I recorded my vocals when everything else was already there. All in all it took from September to October 2007 and now it is finally out (smiles). It was recorded and produced by Seref Alexander Badir and mastered by Rene Berthiaume who is the owner of the studio and the mastermind of upcoming pagan metal band Equilibrium. With the first one we were glad to find one. We had the opportunity to release an album, but after the first one we said, okay, let’s try to find a bigger one with a different approach and see what happens. We are happy that Dockyard1 agreed and now we are actually waiting for reactions on the album and hoping that many people will like it and buy it. Did you do some release parties? There was just one small release party in the area we live in a small pub with intimate contact with our closest fans and friends. There was not a bigger one because up to now we are not that big to organize huge release parties. There is going to be a small release tour in June with three gigs and that’s all for now. We’ll just wait and see how the album will be received by people. He did the mastering when everything was recorded and we had our final mix, he put the finishing touches to it. And we are really happy he did that because he has the background, he is experienced, he certainly knows what he does and we are really happy with the result. So you also live in Munich? I don’t, but two guitarists live in Munich now and the three others live in the south of Bavaria. It is only me that hails from Austria. I live in Salzburg. (laughs) I have to think about that… It was actually when I was thirteen I joined my first band and I was the bass player. I think it took two more years until I started singing and it is not like my family is a family of musicians. It just developed somehow with friends and so on. At fifteen or sixteen I started to take singing lessons and then one thing happened after the other. I got my second band and just started looking for challenging things. Did you have any vocalists or music that inspired you to start? Yeah inspiration… I started to listen to metal when I was eleven years old and it was Iron Maiden who brought me into metal. Bruce Dickinson is the obvious choice. He is actually for me the best singer in rock and metal history and later on I started to like Tobias Sammet from Edguy and I think Eric Adams of Manowar is also really great. That are the people I admire, but I am not really sure if I am inspired by them. I surely do not try to sing like them, but these are masterly voices. The artwork is fantastic. Can you tell a bit more about it? We like it too. The artwork of the first album was by another artist; but this one Ivo Claus is a friend of the drummer and he really did a great job, so we are very happy with it. As you said it makes you dream of foreign countries. But if you look at the back of the cover it is not about dreaming. It is about losing your head into battle (grins). It is not only the beautiful side of it. In the story the battle is featured. Are there plans to tour in future, in Germany or abroad? Let me put it like this: at least we hope to go abroad soon. We did some gigs for example in Switzerland last year, but we did not really plan it. It just happened and right now we are in the same situation. We have not planned anything but of course, soon as we find the opportunity to go abroad, we’ll do that anyway. And do you do this by yourself or with a booking agency or the label? At the moment mainly by ourselves. We don’t have a booking agency, but maybe we should start to think about that. We have some friends and connections who invite us to play somewhere and we invite them to play here. That’s what we usually do, but maybe if the album is selling well maybe that will hopefully change. We still have to grow. Is anyone of you involved in other bands or projects? Yes, I am singing in another band, but we don’t have a name right now because we’ve changed that. We have finished recordings for the first album and we’re looking for a name. I also play in a coverband, we play seventies/eighties stuff and it is called Rock Circus. One guitarist has another band and I think that’s it. In my case it is three bands and it is rather busy. Do you have an idea where the band will evolve to? Will you stay with the concept of historical facts or is there room for other influences? There is definitely room for other influences, but we started writing stuff for the next album and it is going to be another concept album about historical scenes, this time about Napoleon. But we are not fixed on doing historical stuff for ever. If you should choose one song for a videoclip to represent the band, what would you choose? I think to introduce the whole thing ‘The Battle part 1 – Onward’, the fifth song on ‘Hattin’ would be a good choice, not only because it represents the whole spectrum of our musical influences, but also in terms of lyrics it introduces the people directly into the battle what it is all about. The triptych is the core of the album. How did you come to the idea of writing concept albums? It was mainly the historical interests of Stefan, the bass player and main songwriter. We did the first album without a concept and wrote each song about different subjects, so we said for the second one: okay let’s try a concept. And now that we’ve tried this, we see that it works, it is a challenge, so we stick to it for the next album. But I cannot say if it’s always going to be a concept. Was it easier or more difficult to work with a concept? It is not easier. Because every song is connected, there is a logical way of going from the first song to the next song. You have a red line for orientation. It is just a whole different approach. As for the live gigs, I think every song stands on its own. We are going to mix the first and second album in a live situation.